Join us on August 22nd, at 11:30 AM. We will be hosting our 401(k) Advisory Team for a Plan Review. 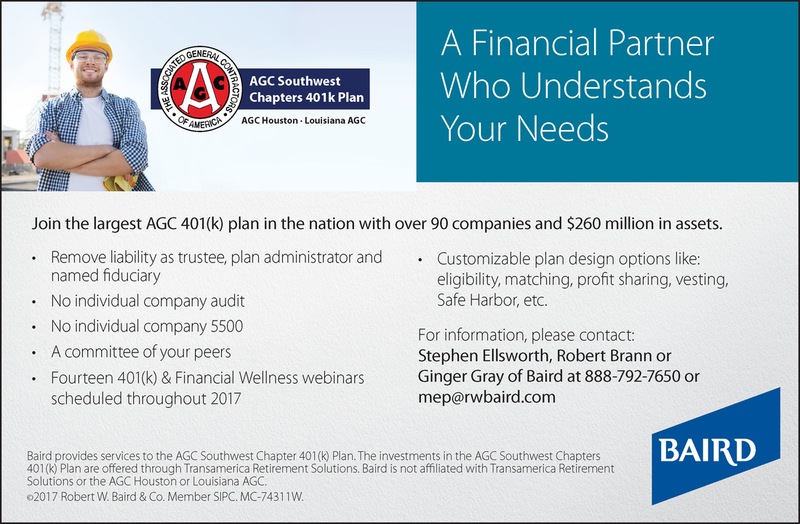 This Plan Review will allow you to do a side by side comparison of your company plan against the Louisiana AGC Plan. In addition to doing this direct comparison you will have the opportunity to hear from our Auditors on how to avoid pitfalls within your own plan. Come join us on August 22nd at the AGC Office in Baton Rouge for lunch, and learn why your industry peers have help this Plan grow to over $260M. You can register for this free luncheon by clicking here. Please call 225-344-0432 or email Michael Demouy at michaeld@lagc.org to get additional information.